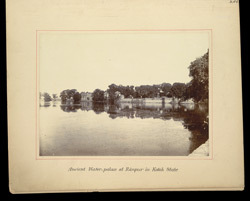 Photograph of an ancient water-palace at Ranpur in Kotah, Rajasthan, taken by an unknown photographer for the Archaeological Survey of India Collections: Northern Circle (North-Western Provinces and Oudh) in 1896-97. The town was named Ranpur after the name of King Kumbha Rana and is popularly known as Ranakpur. Ranpur is located about ten miles south of Kotah and the water-palace is on the banks of a large lake.